Blue State Coffee Latte Throwdowns: Winner- round 22! A big congratulations goes out to Jesse Dooling for winning this round of the latte art contest! Jesse has been with Blue State Coffee since the summer of 2007, and has recently been turning out some amazing art. 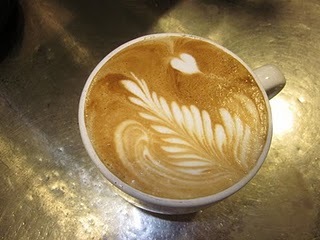 This combination rosetta and heart takes the latte trophy for this round, well done.